Please do not believe that we are asking you to blindly believe the following 5 facts without also reviewing the provided links to the science and analysis which supports the validity of each fact. We sincerely challenge you to also review the expanded explanations for each fact and each fact’s linked documentation (found just below the summary of 5 facts,) and then come to your own conclusions. Fact 1: We are not being told the painful truth by our governments, our intelligence agencies or even our biggest environmental groups about how bad global warming currently is and more importantly, how bad it’s going to get in the near future. Fact 5: There is still no guarantee that we will act any differently than we have for the last 35 years and slow down global warming enough to prevent a fast track to extinction. Therefore, it is time for rational, wise and mature individuals to begin creating personal emergency backup plans and preparations so that they are able to protect themselves and maximize the chances of staying out of harm’s way. This emergency preparation will include migrating to safer areas for much of humanity. These falsehoods about global warming will increasingly cause extreme suffering and loss to larger and larger percentages of humanity. In part, these false statements exist because there have been numerous government underestimation errors and intentionallyinappropriate and incomplete calculations concerning the necessary fossil fuel reduction targets given to the public. This also makes us believe that we are making sufficient and steady progress in reducing global warming when the hard truth is we are not. We are not anywhere even close to where we should be in fossil fuel use reductions to save us from unthinkable climate catastrophes and extinction. 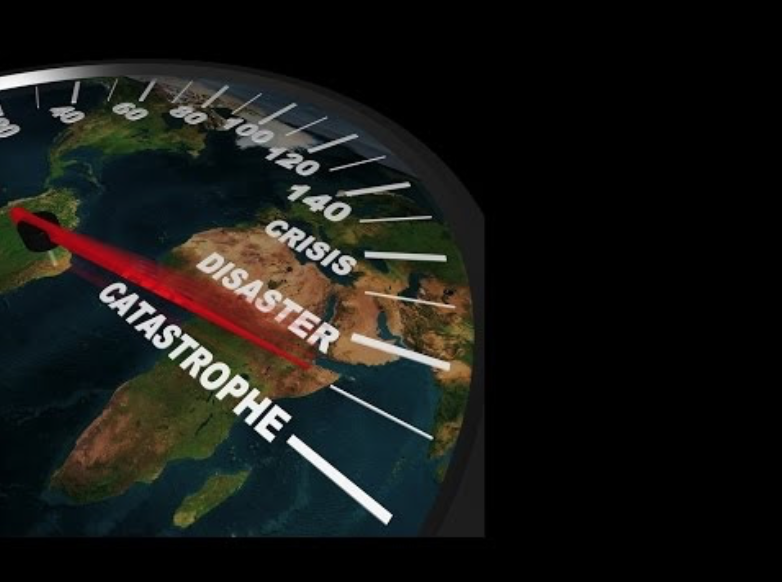 Click here to see how the global warming consequences and tipping points will unfold in what’s called the Climageddon Scenario. Because we have squandered our last 35 years of warnings with denial, inaction, and ineffective action we can’t stop what is coming and what is already locked into our climate system. But luckily, we can still aggressively try to slow down the now unavoidableconsequences so that, at least we can salvage whatever we can. a. immediately and radically reducing our fossil fuel use to the correct reduction levels, (The absolute minimal amount we need to reduce fossil fuel use to prevent ourselves from being very likely to go extinct is as follows. 1. All developed nations must reduce their fossil fuel use by 75 percent by 2025 and then continue reducing fossil fuel use to zero by 2035. This means that allindividuals and businesses within the developing nations of the world must meet these reduction goals. 2. All developing nations must maintain their fossil fuel use levels as they are at the beginning of 2019 and not allow them to go any higher. Click here to learn about your needed personal emergency preparations and the factors behind the short timeframes for people living in global warming unsafe zonesto assemble their emergency plan B preparations and migrate to safer zones. These Plan B personal emergency preparations will also include information on how you can physically, emotionally thrive and survive through the waves of economic, social and political trauma as well as the physical loss, and suffering that is coming. Some of you have already reviewed the supporting science and analysis links provided above and you will soon begin the fossil fuel reduction actions and other solution options also found within the links above. Well done! You will reap the benefits. Some of you will not review the science and analysis verification links. This avoidance may only provide a brief escape from the discomfort of knowing the difficult facts listed above are true as well as acting appropriately using this information. Over time, as you watch the worsening news reports about the destabilization of our climate, the five facts above will begin to ring true and hopefully, you will remember this page so that you and your loved ones will know what to do. We have given you horrible news to digest. Even if you are a wise, mature and healthy individual, if you’re like most people, what you just read will cause you to react with shock and denial and other difficult emotions. If you still continue processing the facts above, you will most likely then enter into a bargaining or experimenting phase to find some kind of a way to deal with such disturbing and disruptive information. If you still continue researching and verifying what you read, you will most likely next enter into a transitional feeling of grief or depression. As you work your way through your grief or depression, you will eventually come to a level of acceptance of what is scientifically accurate, but currently is being widely suppressed by the fossil fuel industry, mass media, and the many politicians around the world owned by the fossil fuel industry. Once you finally reach the level of acceptance for what you have read above, you may likely begin the process of experimenting with new ways to live more sustainably and you will likely begin making new decisions to adapt and integrate this critical information into your life and businesses in other ways. You may also begin emergency preparations for the unavoidable and unconscionable global warming consequences described in the links above so that you are better able to protect yourself and maximize the chances of staying out of harm’s way. Once you truly grasp the true scale and seriousness of our rapidly escalating global warming emergency by working through your emotional reaction to it, you too will realize that our lives and our children’s lives are clearly going to be far more time-limited than we ever imagined unless we act immediately to radically reduce fossil fuel use.